Socks to fit your personality. Check out the huge selection of fun women’s socks at Sock Guy. We were especially particular to the Cupcakes (yes, you remember our sweet tooth! ), but you’ll find others like the Crazy Cat, Groovy, and Land Shark to name a few. 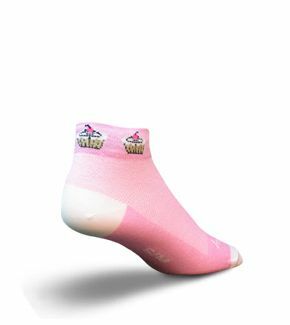 All are made with a special ultra-wicking material with a bit of Spandex, so you have a strong and comfortable sock with great fit. They come in multiple cuff heights: No Show; 1″-2″; 3″; 3″-5″; 6″; Higher LUV (knee high). Show your personality with these fun socks!